Written by Dr. Ashwini V Swamy and medically reviewed by iCliniq medical review team. Hair loss is a common condition faced by people of all age groups. There are various causes for hair loss. Hence understanding hair growth cycle is important to determine if the hair fall is normal or is due to an underlying cause. The human scalp has around one hundred thousand hair follicles. Hair grows in three cycles. The hair follicle undergoes three different phases of activity and inactivity. Anagen- active growing stage. The duration of growth ranges from two to 10 years for scalp hairs, around 80 to 90 % of scalp hair will be at anagen (growing phase) at any given time. Catagen- involutory stage. The hair stops growing and undergoes slow degeneration. This phase lasts for weeks. Around 1 % of scalp hair will be at this phase at any given time. Losing up to 50 to 100 hairs per day is considered normal (physiological). Telogen- resting stage. Around 10 % of the scalp hair will be at the resting stage for two to three months before it is actively shed. Once the hair is shed, new hair starts growing. Each hair again enters these three stages of growth cycle in that order. Terminal hair - thick, coarse, darkly pigmented hair seen on the scalp, armpits, and pubic area in both men and women as well as beard and mustache of men. Vellus hair - thin, short, non-pigmented hair seen on the face of women and in boys before puberty and trunk of men. Lanugo hair - wool-like hair that cover the fetal skin and are shed after birth. Intermediate hair - terminal hairs that are thinner than the classical terminal hairs. These are terminal hairs that are in the process of miniaturization commonly seen in androgenetic alopecia. Depending on the cause of hair loss, different names are given. My problem is regular hair fall. How to control hair loss? Please help. Also called patterned alopecia, it is seen in both men and women. It is a hormonal, progressive condition with genetic influence. Hair becomes thinner as the age advances. It may start as early as in the 20s. In men, hair loss will be seen on both sides of the temporal scalp and over the vertex (center of the scalp). Men will notice hair fall, delayed hair growth, thinning of hair diameter, visibility of scalp skin, initially over frontal area and vertex. As the alopecia progresses, these two patches of hair loss join together leaving a band of hair limited to occipital scalp area (back of scalp). In women, the pattern of hair loss is different from men. Here they notice thinning of hair, visibility of scalp limited to the central scalp, around the parting line. It is very unusual for women to go completely bald as men do. However rarely, male pattern baldness can also be seen in women presenting as baldness over frontal scalp and vertex. This is a stress-induced hair loss. Hair loss will be seen after two to three months of stressful episodes. Stress can be either physical stress (any illness, malaria, typhoid, surgeries, excessive hemorrhage, crash diet, after childbirth) or mental stress (exams, grief, depression). Usually, 10 % of hair will be under telogen (resting) phase. These stressful episodes push more hairs into resting phase, ranging from 20 to 25 %. These resting hairs start falling after three months. Endocrine disorders and subsequent hormone imbalances can cause hair loss. Hypothyroidism is the most common cause among these. Certain medications like anti-cancer medicine, anti-thyroid medicine, increased vitamin A, retinoids can cause diffuse hair loss. Protein-energy malnutrition, zinc deficiency, biotin deficiency, essential fatty acid deficiency, malabsorption syndromes, and anemia can cause hair loss. Smooth “patchy” hair loss, it can affect scalp hair, eyebrow, beard, and mustache. This condition is more common in women than men. There will be unintentional yet conscious pulling of one’s own hair. It is an impulse control disorder. 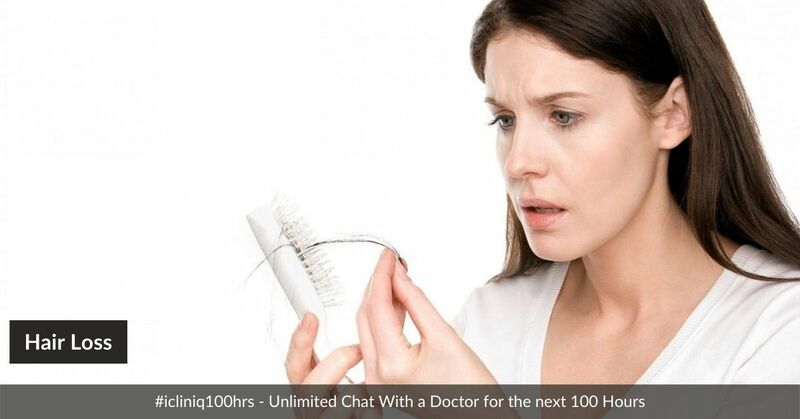 Hair loss is considered severe when there is a loss of more than 100 hairs per day. Treatment of hair loss depends on the cause of hair loss. Hence, a detailed evaluation is necessary in case of hair loss. Blood test including hemoglobin, thyroid hormones, and vitamin D are necessary depending on the pattern of hair loss. Minoxidil - first line of treatment in androgenetic alopecia, this medicine increases the blood supply to hair follicles and promotes hair growth. Minoxidil is available in various strengths. This medicine has to be taken under dermatologist supervision. Oral Finasteride tablets - antiandrogen medicine used in androgenetic alopecia, it should always be taken under dermatologist supervision. Hair nutrient pills - Biotin and Zinc are essential for hair growth. Platelet-rich plasma (PRP) therapy - Platelets which are rich in growth factors are separated from blood and injected into the scalp. This stimulates hair follicles to grow. Always use lukewarm water for washing your hair. Never use hot water. Use any suitable shampoo for washing hairs, at least thrice a week. Washing hairs frequently keeps the scalp free from dandruff. Use antidandruff shampoo if you have dandruff. Avoid using a hairdryer. Allow it to dry naturally after a bath. Avoid tying hairs too tight. Hair needs protein for its growth. Hence the diet has to be rich in protein (eggs, chicken, fish, curd, milk, lentils). Use a comb which has a wide space between each tooth and the tip of the tooth should be blunt. Avoid smoking, nicotine decreases blood supply to the hair roots, affecting the hair growth. Regular exercise for 40 to 50 minutes a day, six days a week. This is essential to keep the body active, and helpful in the management of androgenetic alopecia.